Amazingly powerful multi-flashlight with 1 250 LED lm brightness powered by only one 18650 Li-Ion battery. TIR optics with light angles 70°:120° for wide light without a “tunnel vision” effect. Easy operation and 6 convenient brightness modes. 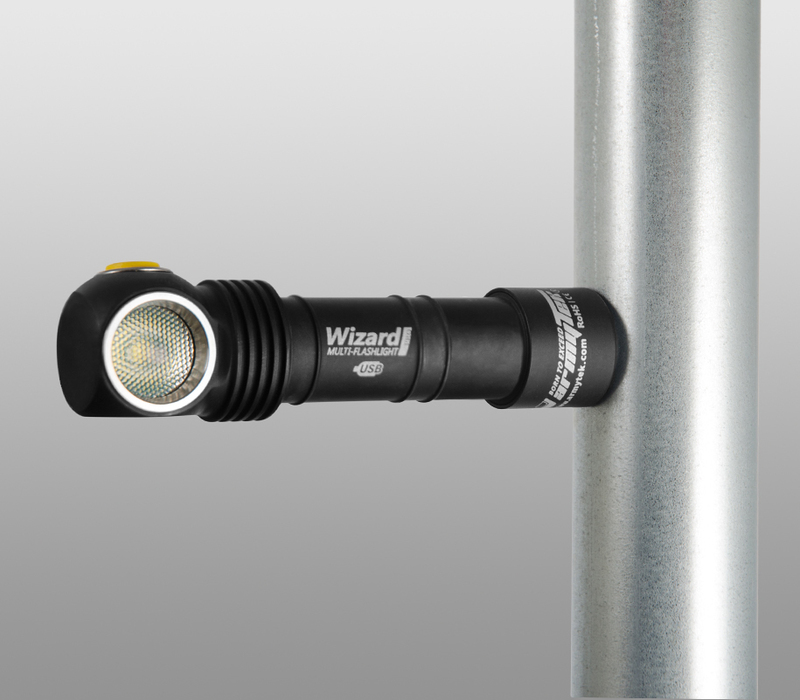 Due to a side switch button you can operate the multi-flashlight easily with one hand without shifting it aside. Compact and light-weight but at the same time durable and multi-functional flashlight. Record runtimes – up to 100 days of operation on one battery. Magnet in the tailcap, removable clip for fixation on a belt and flat tailcap for vertical standing. Complete correspondence to the highest standards of durability and reliability: the multi-flashlight easily withstands fallings,impacts and vibrations. I wasn't familiar with the brand before I got the light. And I can say that it suits perfect in my EDC collection. Powerful and bright, I like it a lot. Absolutely awesome headlamp! Its extremely bright when you need it, but also has very low light modes that I find very useful. The battery life at normal brightness levels is excellent, I typically can use it camping for 4-5 days straight without any battery swaps or re-charges. The low light modes are great when you only want a little extra light without losing your peripheral vision, or for when your eyes are already adjusted to the dark and the normal brightness would be blinding. The button and mode-selection are very well thought out and intuitive. I love how it remembers your last setting, so with one button press you turn on/off the light without going into some unexpected mode. The headlamp and straps are very well built. My only issue is the built in USB charger can be a little fiddly, and doesn't always finish charging when plugged into a computer USB port. But every time I've used a high-current phone USB charger, and made sure the magnet connector was on right, it has charged fully. Despite the charger's minor quirks, its benefits greatly outweigh the issues. I love being able to bring just the headlamp and a car or wall outlet USB charger when traveling. Thank you for your feedback. We hope you enjoy the light and it is your personal helper in any needs. Concerning the USB-magnet charger our service manager will contact you as soon as possible. We appreciate you being with us! Best regards, Armytek Team.